Packing and loading your belongings is arguably the most physically demanding part of your move, so it's understandable that you might want to speed through these jobs and get them over with quicker. But when you begin rushing through things, that's how mistakes get made and, more importantly, that's how people can injure themselves or belongings can get damaged. That's why it's important to go about the packing and loading process as carefully as possible and make sure that you tackle each job one step at a time. That way, you can make sure to avoid making mistakes that can cost you money in the long run, whether it's from broken or damaged items, or from doctor's bills. When you pack, remember that you're eventually going to have to move these boxes after loading, which means they'll need to be picked up and carried. So if you think you're simply being efficient by managing to cram half of your kitchen into one cardboard moving box, you might actually be asking to hurt your back or someone else's when they go to pick up the box and carry it. Beyond personal injury, there's also the issue of items inside of the box being damaged from the sheer weight of what is packed in there. It goes without saying that fragile items should go on the top of the box and not on the bottom below heavier items, but it's also possible that packing a box too heavily will cause the box to break under the weight, which may damage the items inside the box. It's smart to keep in mind what you're putting in the boxes you're packing when you pack them. Putting together fragile or delicate items with bigger, heavy items could cause damage to the more fragile items and creates an imbalance in your boxes that can make it difficult to load and unload them when it comes to time for that. Also, make sure that when packing you make a note of where certain things are and where your most important and valuable belongings are packed. 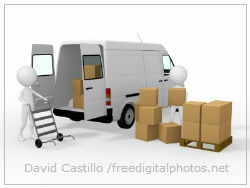 This will help you avoid stacking heavy boxes and heavy items on top of your valuable possessions on the moving truck. When it comes time to load the moving truck, don't stack the boxes too high on top of one another, as this can cause them to become unsteady and possibly topple over in transit to your new home. Also, as mentioned before, keep the heaviest boxes on the bottom and stack the lighter, smaller boxes on top of them to prevent crushing the boxes and causing further damage to your belongings. If you follow these simple steps for carefully packing and loading the moving truck, you will manage to avoid most of the problems that might come from rushing through this process, and you'll also manage to avoid injuring yourself as well.